Something had to come out of this tetrahedron stew, so I asked myself, "Why wouldn't a kenning analogy, which has four terms, fit onto a tetrahedron?" 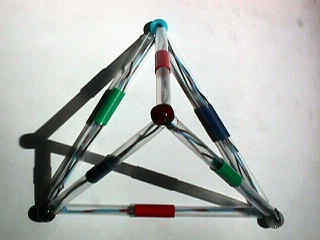 I quickly built a tet with drinking straws and rubber bands, based on a modelling technique Karl Erickson had shown me. I taped up each strut, and coloured the tape red, green, and blue according to which strut it was on (more in a minute). I looped telephone wire through the beads you see and stuck each leg of the leftover wire down a straw. I call the result a "kentet abacus" (Fig. 1). 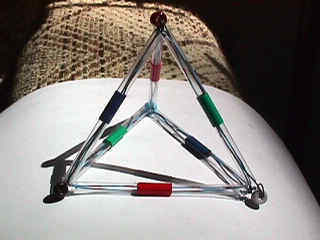 "Kentet" stands for "kenning tetrahedron" and recalls "quartet" and fourness. "Abacus" recalls Hesse's statement that the Glass Bead Game got its name from the early bead abacuses on which the games were played. There are three basic sorts of links between the terms here: accompanying (ship accompanies sea, horse accompanies road), matching (ship matches horse, sea matches road), and zigzag (ship is zigzag from road, sea is zigzag from horse). For the purposes of the abacus, each has a colour (Table 1). I also assigned a bead of a different colour to each term in the kenning analogy (Table 2). So, what you're looking at in Figure 1 is ship (grey) at the top, sea (blue) in the lower right, and horse (brown) at the lower left. Between ship and sea is a blue strut (Across), between sea and horse is a red strut (Zigzag), and between horse and ship is a green strut (Matching). To make a kenning for a term, all you have to do is follow its blue strut to the first part of the kenning, and then follow the red strut to the second part. This works for every kenning -- it's the old "across, then diagonal" trick again. You can see that you have to go clockwise. I call this a left-handed kenning abacus, because you read the kenning from right to left. It is possible to construct right-handed kenning abacuses too, in which the kennings read properly from left to right and you move counterclockwise to construct them (Fig. 2). Figure 3 shows the same right-handed kentet abacus displaying a kenning for "horse", and Figure 4 shows a top view of the same abacus. After I had turned these models in my hands a little while and meditated on them, I felt I understood a little of how kennings become tetrahedra. I took the geometric/memetic modelling tool called Struck (now being rereleased as Fluidiom), and rendered a model of the Psychedelic Game, the very first game ever composed in Kennexions. I found something surprising: the game composition, which seems so symmetrical and harmonious in text, is actually slightly asymmetrical when rendered graphically. Notice the link between Logos and Eris. 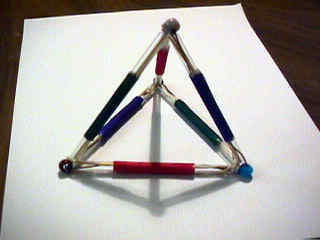 This is called an edge bond; that is, their respective tetrahedra are joined along an edge. 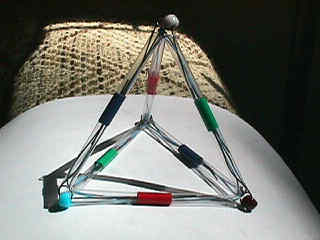 All other bonds in the game are vertex bonds; that is, their tetrahedra are joined at the vertices. Well, I was expecting something surprising, so perhaps this isn't so surprising in retrospect. It would have been surprising had I gained no new information.